How will your clients, customers, and users react a disruption? Will they react in a way that will be more or less disruptive to the business and its operation? Will the disruption have an impact on other activities? For example your sales force may still be able to make sales call but the distribution arm of the company may be at a standstill. How will the event impact the overall reputation of the enterprise? Will there be an adverse media or social networking publicity? Once the event is over how quickly will you company be able to catch up and get back to business as normal? During the outage and how much revenue will your company lose? Will there be any contractual or legal penalties that will be imposed and how extensive will they be? If the event impacts items that will need to be repaired or replaced, will the repair parts, maintenance staff, and replacement equipment be available? At what cost? If you activate other services, overtime, or incur other expenses what will the cost of that be? To address those issues we have found that a speadsheet like the one below will help to summarize the information that you will collect and present. 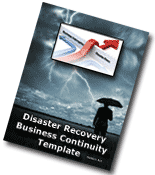 The DRP template is over 200 pages and includes everything needed to customize the Disaster Recovery Plan to fit your specific requirement.